Last week, I showed you my shawl. I didn’t tell you the pattern because I had detected two errors within the pattern. I reached out to Red Heart and they quickly realized my findings were accurate. With that, they did the corrections and added the omissions into the article. I really enjoyed this pattern and it was really easy. I used Red Heart Boutiques Unforgettable. The colour I used was called Echo. 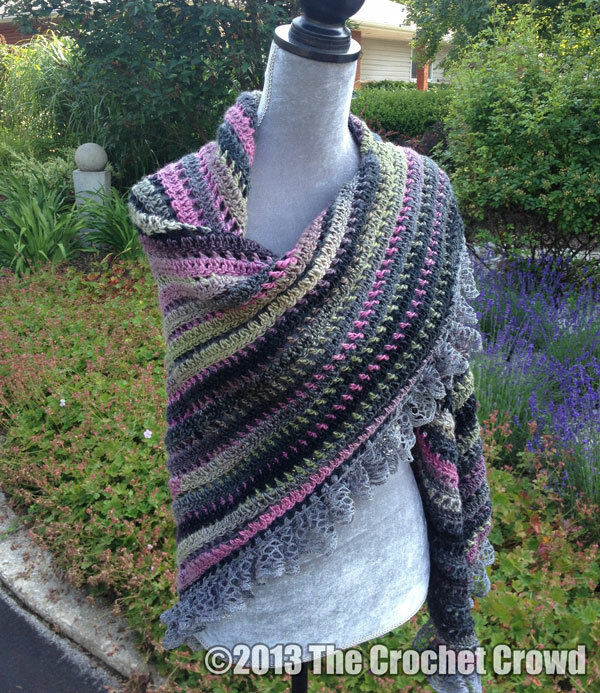 If you are looking for a sharp looking shawl, this may just the pattern you need. By the way, I substituted the border fringe by slip stitch Red Heart Sashay into the final edge. I slipped stitched the sashay into every other gap space and grabbed the Sashay by every 3rd hole in the edge of the Sashay. Turned out pretty snazzy I think. Amazing Looking Shawl. Red Heart’s Top Down Shawl Pattern. 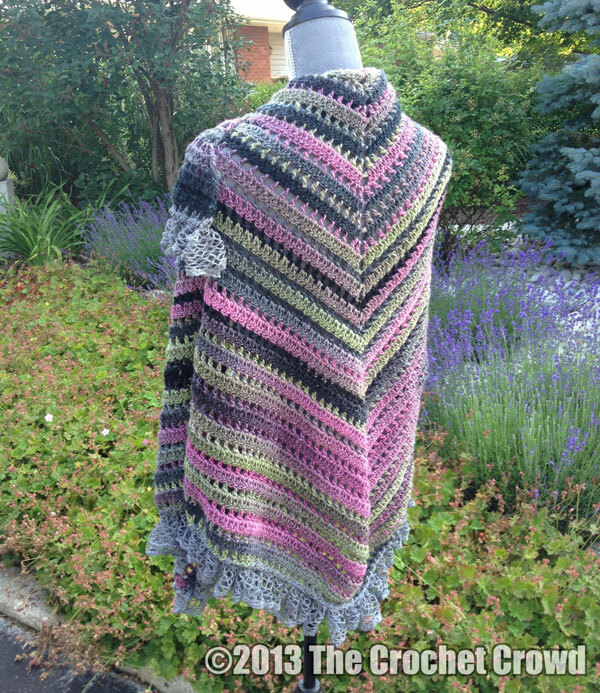 This entry was posted in Adult Clothing and tagged Art, Craft, Crochet, Eastern Time Zone, Exciting New Crochet Shawl, Free Pattern, Knitting and Crochet, Mikey, Pattern, Red Heart, Red Heart Boutiques Unforgettable, Red Heart Sashay, Shawl, The Crochet Crowd, Yarn. Bookmark the permalink. That is absolutely beautiful! I love that you added the Sashay at the bottom!! Very creative!!! Mikey said he used boutique unforgettable which is 3.5 ozs and 279 yd (256 m) per skein (ball). So if you want to substitute another yarn you would need approximately 810 yds or 780 m of comparable yarn (meaning same weight yarn). Thanks Joy Allen. I understood it after I looked at the pattern. Are you planning on a video tutorial for this? I have skeins that are 7 oz or 11 oz or 14 oz. So which one equals 1 ball? I live in The South in the USA and have always bought my yarn by “X” number of skeins that weigh “X” number of ounces – and then the weight of the yarn factored in. Until I started watching Mikey’s videos, I had never heard of the quantity of yarn needed referred to as balls. It’s always good to learn something new. My mom always called them yarn balls. Hey Mikey, Exactly what do you mean by “3 balls of yarn”? I think in some of your tutorials, you also use the term “ball”. This is confusing to me since I buy yarn in skeins that are marked by ounces, grams, yards & meters on the label. So how much does a “ball” equal? The pattern is posted. I used the same yarn required in the pattern. I just changed the colour. Love your tutorial videos. I’ve always had trouble reading patterns. You have taught me so many new stitches and patterns. Christmas gifts are in the works for all the grandkids and great-grandkids! Thanks again. Thanks Mikey for finding the mistakes, it will save me a lot of time and , I will now begin making this shawl for my friends birthday.